Michelle Wie is a phenomenal, powerful golfer who regularly hits the ball nearly three hundred yards off the tee, about fifty yards farther than the average professional woman golfer. At nearly six feet tall and about 150 pounds, she has the strength and skills to match many professional players, including a number of men. In January of 2004 she competed in a men's event, the Sony Open, part of the Professional Golfers Association (PGA) tour. While she missed the second-round cut by just one stroke, she did end up beating forty-six men. During the summer of 2004 she was part of the U.S. team that won the prestigious Curtis Cup. In 2003 she won the U.S. Women's Amateur Public Links championship. While Wie has had a promising career so far, the reason for her headline-making status is not simply her accomplishments on the course: Wie is one of the most famous women golfers in the world because she became a world-class golfer before the age of fifteen. Sports Illustrated 's Michael Bamberger pinpointed the source of Wie's success in a 2003 article: "Her swing is a dream. No 150-pound golfer, male or female, has ever made hitting a three-hundred-yard drive look so effortless." Michelle Sung Wie (pronounced WEE) was born in 1989 in Honolulu, a city on the island of Oahu, part of the state of Hawaii. She is the only child of Byung-Wook and Bo Wie, both of whom were born and raised in South Korea. Byung-Wook, known as B. J., acts as his daughter's coach; through 2003, he was her caddie as well. Aside from his coaching duties, he is a professor of transportation at the University of Hawaii. Wie's mother, Bo, is a real estate agent and former Korean amateur champion golfer. "You can read about her all you want. You hear everything there is to be heard, but when you see her swing—when you see her hit a golf ball—there's nothing that prepares you for it. It's just the scariest thing you've ever seen." Fred Couples, pro golfer and winner of 1992 Masters Tournament, in Golf World January 24, 2003. Wie began playing golf regularly at age four, at which point she could hit the ball one hundred yards. Her father told Golf World 's John Hawkins in 2003 that "Michelle has always liked to hit the ball hard. Sometimes it would go right, sometimes left, but it didn't matter. She just wanted to hit it hard." By age nine, having been coached by her father for many years, she was scoring better than her parents on the course. During 2000, at age ten, Wie became the youngest golfer to qualify for match play at a major adult event, the U.S. Women's Amateur Public Links (WAPL) championship, an extraordinary achievement that captured the attention of the media and golfing fans. By the time Wie was twelve years old, she was winning most junior amateur tournaments, even the ones in which young men played as well. She stunned observers with her ability to drive the ball nearly three hundred yards, a distance many professional women golfers never achieve. After winning the Hawaii State Junior Golf Association's Tournament of Champions in 2001 and 2002, Wie and her parents felt that she could be a contender in major tournaments. Michelle Wie watches her drive shot during the 2003 CJ Nine Bridges Classic in South Korea. 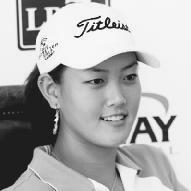 Early in 2002 Wie qualified for the Takefuji Classic, part of the Ladies Professional Golf Association (LPGA) tour. It was her first LPGA tour event, and while it is not a major tournament, Wie did make history by becoming the youngest golfer to qualify for an LPGA event. In the 2002 WAPL, Wie reached the semifinals, again making history by becoming the youngest golfer to reach that level of competition. An accomplished student at Punahou School, a private academy in Honolulu, Wie began taking time out from her academics for intensive golf study in the spring of 2002, when she made her first visit to the David Leadbetter Golf Academy in Bradenton, Florida. She has since spent a great deal of time there, studying with Gary Gilchrist. Gilchrist has worked with a number of young women golfers, but he acknowledges that Wie possesses something unique. For a 2003 Golf World article he told Hawkins: "I don't know if we'll ever see a woman hit [the ball] this far with such effortless action. Ever." In 2003, at age thirteen, Wie played in her first major event, the LPGA's Kraft Nabisco Championship at Rancho Mirage, California. She scored a stunning sixty-six in the third round, tying a record for the lowest score by an amateur at an LPGA major. She finished that round in third place, but her score of seventy-six in the final round resulted in a tie for a ninth-place finish. While her final score fell short of the promise exhibited in the third round, a top-ten finish for such a young player indicated the beginning of a stellar career. Later that year, Wie proved herself without a doubt: she won the WAPL championship, becoming the youngest player to win the event and indeed the youngest to win any adult United States Golf Association (USGA) event. In January of 2004, Wie demonstrated not just her skill but her courage and confidence by competing in a men's event: the Sony Open, run by the PGA, at Waialae Country Club in her home city, Honolulu. Her score after the initial two rounds was one stroke off from the cutoff, meaning that she did not advance to the third round. The youngest golfer ever to play in a PGA event, Wie tied for eightieth place overall, scoring higher than forty-six of her male competitors. While there is clearly room for improvement in her game, particularly her putting, some observers have described her swing as nearly perfect. Her caddie during the Sony Open, former South African professional player Bobby Verwey, told John Hawkins of Golf World: "That golf swing, it's the best I've ever seen. Everybody is looking for the perfect swing, but a twenty-five-year-old guy can't do that. The suppleness, the flexibility—you have to be fourteen to swing that way." In March of 2004, Wie entered the Kraft Nabisco Championship for the second time, finishing in fourth place, up from her ninth-place finish the year prior. In June of 2004 she was part of the youngest squad in the history of the Curtis Cup, a prominent two-day event played every two years. No player on the U.S. team was over the age of twenty-five, and the team's average age was just a bit over eighteen. Wie was the youngest of the eight-member team by two years. Playing in northwest England, the U.S. team won the trophy, beating the Great Britain and Ireland team (GB&I), which had won the Curtis Cup every time since 1996. Wie's triumph at the Curtis Cup was followed by disappointment later that summer, when she tearfully lost the 2004 WAPL championship to another teenager, fifteen-year-old Ya-Ni Tseng from Taiwan. During that same summer, she played in a qualifying round for the U.S. Amateur Public Links championship, traditionally a men's event. She failed to qualify for the event, but she finished just two strokes behind the winners. During a summer filled with competitive ups and downs, Wie found herself at the center of a controversy. On rare occasions, the USGA—which conducts thirteen national championships, both professional and amateur, each year—has offered exemptions to players in the Women's Open and the Men's Open, allowing those players to enter the tournament automatically without having to win qualifying rounds. Wie was granted a special exemption to play in the U.S. Women's Open in July of 2004. When Wie's exemption was announced, many professional players expressed their disapproval. They felt that Wie should earn her way into the event, both for her own growth as a player and to be fair to other golfers. Many players agreed that the tour officials gave Wie the exemption because her presence at the Women's Open would attract more money from sponsors and from ticket buyers; opinions were divided over whether that financial motivation was good for the game of women's golf or not. Wie quieted many of her critics when she played well enough to make the cut after the second round, the point at which many players are eliminated. She finished the event in a tie for thirteenth place. Like many young golfers, Wie idolizes the game's top players, especially Tiger Woods and Ernie Els. Unlike most golfing kids, however, Wie had the opportunity to meet her idols, doing so during the 2004 Mercedes Championships, just before the Sony Open. Els and Woods generously gave Wie advice about her game and a boost in her confidence through their kindness and attention to her. Els invited Wie to join him in a practice round, offering putting pointers that significantly improved her performance. In a January of 2004 article in Golf World, John Hawkins wrote that Els "pulled the girl aside ... and rebuilt her long-putting stroke in less than five minutes." Wie has even been granted a nickname—the Big Wiesy—that echoes that of Els, the Big Easy. In spite of her early successes in events both amateur and professional, Wie does not plan to turn professional until after graduating from college. She hopes to attend Stanford University, the same college chosen by Tiger Woods. Once she turns professional, Wie's goals are simple but by no means easy: she plans to become a dominant player in both the LPGA and the PGA. As an amateur, she hopes to one day play in the Masters Tournament, golf's most prestigious event. The sticking point for women wishing to play in the Masters is that the event is held at Georgia's Augusta National Golf Club, a course no woman has ever played on. As with other young elite athletes, Wie's early exposure to the intensity of high-level play and to media attention has caused many to express concern that she has forfeited her childhood and given up the chance at a normal life. Wie responded to such concerns in an interview with Tim Rosaforte of Golf World: "I guess I'm not normal, first of all, so I can't have a normal life. I guess if you grow up normal, you'll always be normal, and I don't want to be normal. I want to be something else." Bamberger, Michael. "Next Stop: U.S. Open." Sports Illustrated (July 7, 2003): p. 32. Hawkins, John. "Island Girl." Golf World (January 24, 2003). Hawkins, John. "Wie-markable." Golf World (January 23, 2004): p. 14. Herrington, Ryan. "Old Enough for the Job." Golf World (June 18, 2004): p. 22. Herrington, Ryan. "The Crying Game." Golf World (July 2, 2004): p. 21. Rosaforte, Tim. "Youth Is Served." Golf World (June 27, 2003): p. 18. Sirak, Ron. "Too Easy for Big Wiesy." Golf World (June 4, 2004): p. 5. Kelley, Brent. "Michelle Wie Biography." About.com. http://golf.about.com/cs/womensgolf/a/wiequotes.htm (accessed on August 17, 2004). "Meet Golf's Latest Teenage Sensation." BBC Sport Academy. http://news.bbc.co.uk/sportacademy/hi/sa/golf/features/newsid_2078000/2078650.stm (accessed on August 17, 2004). "Michelle Wie: Pro Golfer." Kidzworld. http://www.kidzworld.com/site/p1848.htm (accessed on August 17, 2004).